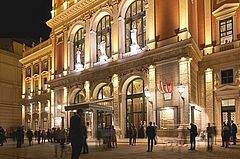 The Vienna Musikverein launches its own, new festival on May 6 - with a focus on Debussy, Bernstein and Beethoven, with almost 60 concerts and with many great names. The Musikverein Festival Vienna offers an impressive 70,000 tickets, 36 performance days, twelve guest orchestras as well as first-class international conductors and soloists: Performers include Martha Argerich, Daniel Barenboim, Maurizio Pollini and Hélène Grimaud on the piano, Julian Rachlin on the violin, and Elisabeth Kulman, Diana Damrau, Ian Bostridge and Michael Schade as vocalists. A music festival at the Musikverein is inconceivable without the Vienna Philharmonic: Conducting the Philharmonic concerts during the new festival are Zubin Mehta as well as Mariss Jansons and Andrís Nelsons. Franz Welser-Möst and the Cleveland Orchestra perform all of Beethoven's symphonies as part of their "Prometheus Project". Leonard Bernstein is honored on his 100th birthday with concerts: by the Vienna Philharmonic under Zubin Mehta, by the Philadelphia Orchestra under Yannick Nézet-Séguin and by the ORF Radio Symphony Orchestra Vienna under Cornelius Meister. Claude Debussy once stood at the conductor's podium of the Large Musikverein Hall himself as a much admired guest. One hundred years after his death, Daniel Barenboim conducts the Staatskapelle Berlin in three Debussy concerts. The program includes the mystery play "Le Martyre de Saint-Sebastien" with the singers Anna Prohaska and Marianne Crebassa, and has Maria Furtwängler in the speaking role. The Staatskapelle and the Berlin Philharmonic travel to Vienna from Berlin. Sir Simon Rattle, who took over from Claudio Abbado as principal conductor at the Vienna Musikverein in 2002, bids farewell to Vienna's music fans as conductor of the "Berliner".